This pattern set, although free to download, is under copyright and may not be distributed by anyone in any format other than by the copyright owner. © 2005 by Margaret Parker for MKDesigner. All rights reserved, both foreign and domestic. Please inquire FIRST if you wish to link to this pattern from your website or in a newsletter. 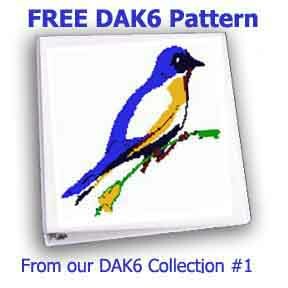 This cute little Blue Bird is part of our DAK6 Collection #1. Click to download either the .pat file or the Graph which is a WORD document.